Notes: Scuds can be found in both lakes and streams. 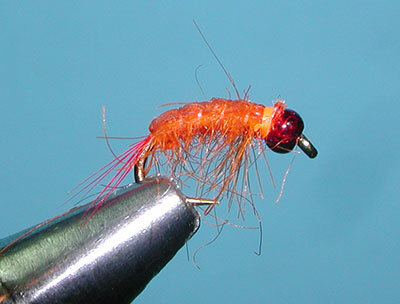 The above pattern is generally attributed to Randall Kaufmann and is featured in his book "Tying Nymphs". Randall mentions using the scuds for Golden Trout within the lakes of the John Muir Wilderness near French Canyon, which is just west of Bishop at 11,000'. 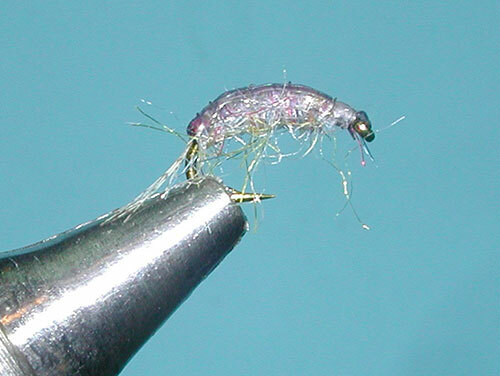 Large scuds of size 8-14 are usually Gammarus, whereas the smaller scuds of 16-20 are Hyalella. Generally, scuds should be fished with an indicator in slow-moving waters near banks and vegetation. Inspecting weedbeds along the shoreline will usually indicate the size and color of the scuds that are present. Most of the feeding of scuds thake place beneneath the surface and throughout the water column. 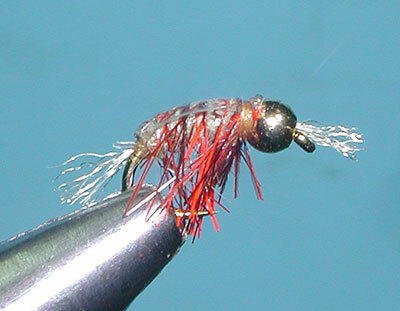 Sierran trout tend to feed upon Hyaella scuds exclusively just before winter in sizes 16-18. It is also suspected that scuds play a major diet for the trout while overwintering in iced-over conditions. Try Olive, Grey, Fluorescent Pink, and Fluorescent Orange. Scuds can be weighted either with lead wraps around the hook shank or with Beads.